In years past, bicycling to school was a rite of passage — many children learned the rules of the road that later would help them become better drivers by riding a bike to and from school. Today, some schools discourage or ban bicycling by students altogether. However, in other communities bicycling to school is wholeheartedly encouraged. 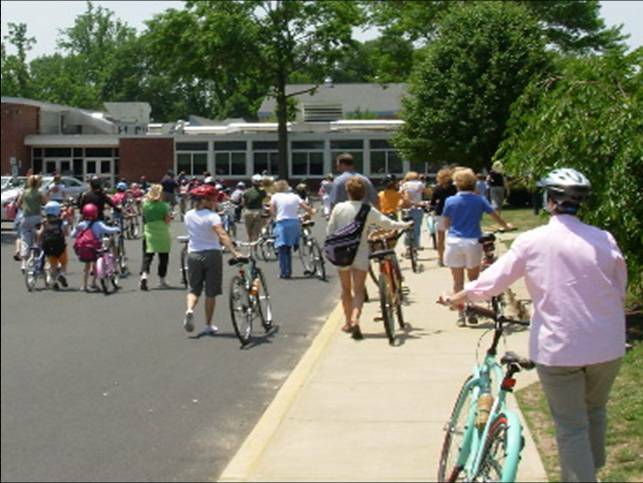 To find out what can be done to create a bike-friendly environment, we spoke with several New Jersey communities with high percentages of children who bike to school. Though some of the details may differ, one common element that emerges in all these communities is an active bicycle promotion and education component. Simply knowing how to ride a bike is not enough; these communities recognize that before students hop on a bicycle, they need to learn the road skills to ride safely. At Seaview Elementary School in Linwood (Atlantic County), Principal Susan Speirs reports that class time is devoted to bicycle education each year. During school hours, a teacher runs the annual 4th Grade Bicycle Rodeo. During the rodeo, children receive detailed instruction on how to ride their bikes properly and then take a bicycle safety test. Class time is also devoted to bicycle education in Medford Lakes (Burlington County) where pupils receive instruction as part of the school’s physical education program. In Wharton (Morris County,) Superintendent Richard Bitondo encourages a bike-to-school environment through annual bike rodeos. The rodeos offer bicycle inspections and helmet giveaways to children without access to a proper bike helmet. A police-sponsored bike rodeo is also an important part of the bicycle program in Fair Haven (Monmouth County.) School staff make a point of regularly reminding children about bike safety during their lunch periods. In addition, Principal Jamie Turner and Nurse Barbara Grimmer of the Viola Sickles Elementary School point out that Fair Haven police hand out “tickets for good behavior.” Under this program, when an officer spots a child who is biking correctly, the rider is issued a prize. While annual bike rodeos and in-school education programs are great for teaching kids about safety, other special events held throughout the year can help deliver the safe bicycling message. In Linwood, Principal Speirs said that students at Seaview Elementary celebrate Earth Day each year by walking or biking to school. After Earth Day, each Wednesday for the rest of the school year becomes walk- or bike-to-school Wednesday. Spiers takes part by meeting children at a local park one half hour before classes begin and walking with them to school. In Fair Haven, “Transition Day” has been an annual part of the school year for so long that the staff of Viola L. Sickles School can’t remember when it all got started. Principal Turner, who has been a part of the tradition for the last 10 years, joins her graduating 3rd graders on the last day of school, jumping on their bicycles for a ceremonial ride over to the Knollwood School to mark the transition to 4th grade. Parents, police and the school superintendent all take part in this annual event. Along the route, parents hold up signs to celebrate their child’s completion of the 3rd grade and at the Knollwood School, 4th graders welcome the arriving group with songs. The special events in Linwood and Fair Haven help to make biking to school an important and fun part of life. The safety of children biking to school is a primary concern in each of these communities. Children in Wharton, Linwood, Fair Haven, and Medford Lakes understand that biking to school is a privilege, one that can be taken away if they don’t follow the school safety rules. In New Jersey, it’s the law that all children under 17 must wear a helmet when riding a bicycle. In support of the law, Principal Turner in Fair Haven requires parents give their children permission to bike to school by signing an emergency card. Children must pledge to wear helmets and parents must acknowledge that helmets are mandatory; should a child be caught riding without a helmet, their bike will be held by the principal until their parent comes to pick it up. Similarly, children in Lebanon (Hunterdon County) must bring their bikes and helmets to school for an inspection and attend a bicycle safety program. Students must also have their parents sign a permission slip before they are able to ride to school. Repeated offenses cause biking privileges to be suspended. In Wharton and Medford Lakes, children not only are required to register to bike to school, they must also sign a safety pledge. As part of this pledge, the children promise to follow all the school rules regarding bike safety and to always wear a helmet. While Superintendent Richard Bitondo admits enforcement can sometimes be a challenge, bike privileges have been taken away from students in the past, showing students that the Wharton schools are serious about safety. Many schools that ban biking do so out of fear of injury and bicycle theft. In Wharton, Linwood, Fair Haven, and Medford Lakes, there have been no serious bike-to-school related accidents. While crashes can sometimes happen, the bicycle education programs in each of these communities have helped prevent incidents with detailed safety knowledge. While most of the communities reported that they have had no problems with theft, Principal Spiers and Superintendent Bitondo said that theft had been a concern in Linwood and Wharton. In both communities, a simple solution has virtually eradicated the problem while actually working to encourage even more children to ride. 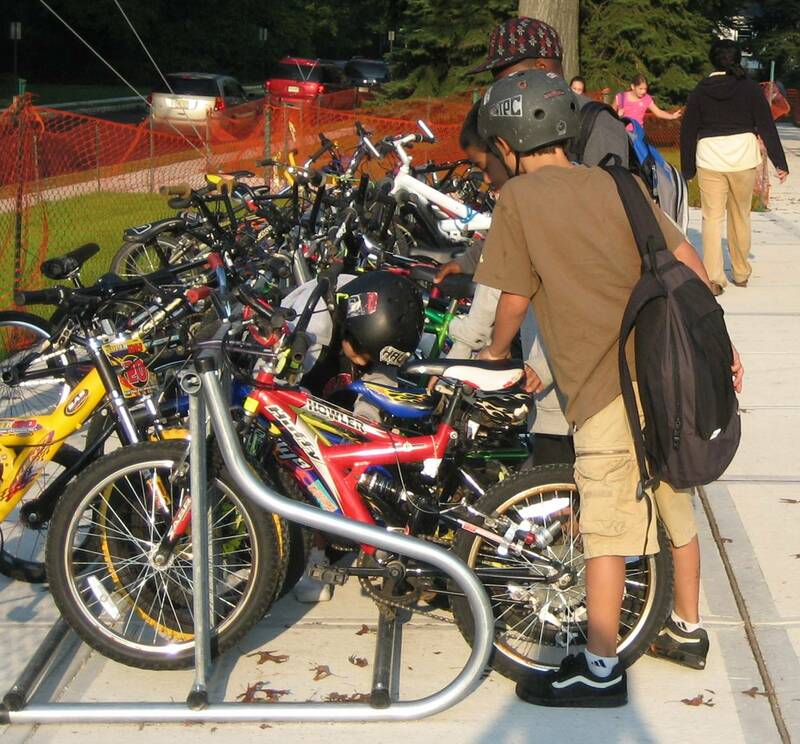 By relocating the school bicycle racks to more visible and prominent areas, theft issues have all but disappeared. With theft concerns no longer an issue, children in Linwood and Wharton gain even more reason to bike to school. Promoting bicycle safety and biking to school is not something a school staff has to do on its own. In each of the four communities, the school has worked with various local partners to help educate and encourage students. One great resource in each case has been the local police department. From running bike rodeos and education programs to helping to determine the safest biking routes to school, local police have had a lot to offer. In Medford Lakes and Linwood, parents have also proven to be an important asset. Chief Martine has worked with the parents in the Medford Lakes Home and School Association to organize and run many successful bike safety events. In Linwood, Principal Speirs works with skilled parent volunteers to provide free bike tune-ups and to fix minor problems at the annual bike rodeo. Seeking the help of outside groups and organizations can also prove beneficial. In Wharton and Medford Lakes, local bicycle vendors have become excellent partners in various bike safety and bike promotion events. Bitondo said that Wharton has also received assistance in the past from its local Safe Kids organization http://www.usa.safekids.org/state display.cfm and county Transportation Management Association, TransOptions http://www.transoptions.org/. To effectively promote biking to school, you must recognize the unique opportunities that your community presents. Turner and Grimmer report that biking to school has not been a hard sell in Fair Haven as local residents tend to be “active and outdoorsy” people. Walking and biking fit in very well with their town’s culture. Chief Martine has experienced a similar bike culture in Medford Lakes, noting that local kids have always gotten around on bikes. Many Medford Lakes residents grew up in town biking from place to place themselves and now that they are parents, they encourage their children to do the same. Martine said that Medford Lakes also benefits from numerous bike trails throughout town. Recognizing similar benefits, Principal Spiers said a bike path in Linwood has helped make biking to school an easy and enjoyable option for students. Spiers said that Seaview Elementary School benefits by being located directly on a bikepath that runs from one end of town to the other. Unfortunately, not every town in New Jersey has the advantage of numerous bike paths and a strong community biking culture. However, that doesn’t mean that they lack opportunities to promote biking to school. In Medford Lakes, Chief Martine described how the police chief in the 1970’s mapped out the safest biking routes to school. As the town has expanded and demographics have shifted, so have the biking routes. By incorporating an effective bicycle education program, implementing sound bicycling rules and policies, and working to identify the safest routes to school for biking, any town can help encourage children to bike to school and foster a community bicycling culture.